What can you buy someone who’s just had a baby? There’s so much to buy. Learning First aid for their most precious will be a gift forever. An original, unique and thoughtful present that every parent will appreciate as their little one grows. Parents love our non nonsense, practical and modern courses, so much so once a parent has been on one of our first aid classes for babies & children, they often send another family member. A gift that can literally save a life. 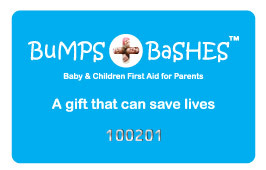 Cost £30 and can be exchanged for any open Bumps & Bashes first aid course or used towards our popular home class. Something different than a baby grow.